There are too many groups dissatisfied with the way the agitation in the Madhes has been called off. Here in Janakpur, the epicenter of the Madhes agitation, Dhanusha district police charged three people with the murder of Nepali Congress member Rajendra Yadav earlier this month. Three other NC members had been injured the same day, and the three announced they were acting on behalf of a newly-set up armed group, and killing Yadav was their first direct action. Police here fear that the recent Madhes agitation and its partial resolution have led to dissatisfied radicals taking to violent politics. A month ago, a police officer was gunned down by an assailant belonging to the Jai Krishna Goit group in Saptari, and the same group also tried to set off an explosion there which was defused by the police. These and other incidents show that the plains may be headed to another period of violence and instability after six months of strikes and blockade. People in the plains are weary of strikes and want to get on with their lives, but political activists are competing to be more radical. With more than half the population of the Tarai aged under 20, it is difficult for political parties led by older leaders to keep control. Younger Madhesis have been radicalised by the heavy-handed response of the security forces during the agitation in which nearly 60 demonstrators, many of them innocent bystanders, were killed. The youth are also angry at the Madhesi Front leaders who led them with slogans like ‘Abhi Nahi To Kavi Nahi’ (Now, or Never) and then struck a deal with Kathmandu to call off the blockade. Jani Khan, one of the protesters on the streets, said: “One group of Madhesi youth is not happy with the agreement and think that the Madhesi people will never get their rights unless they raise the gun.” Khan says the people in the Tarai feel the reason the first Madhes Movement in 2007 was successful was because Jai Krishna Goit and Jwala Singh had gone underground with arms. “Now we only have a non-violent track, that is why Kathmandu is not listening,” Khan said, referring to the Madhesi demand for the demarcation of the two provinces in the plains. Youth leader Shyam Gupta told me in Kalaiya that young activists like him are not expecting much from the high-level mechanism set up to find a compromise on the provincial demarcation. It is probably because of the radicalisation of the Tarai that the Front refused to join the mechanism. 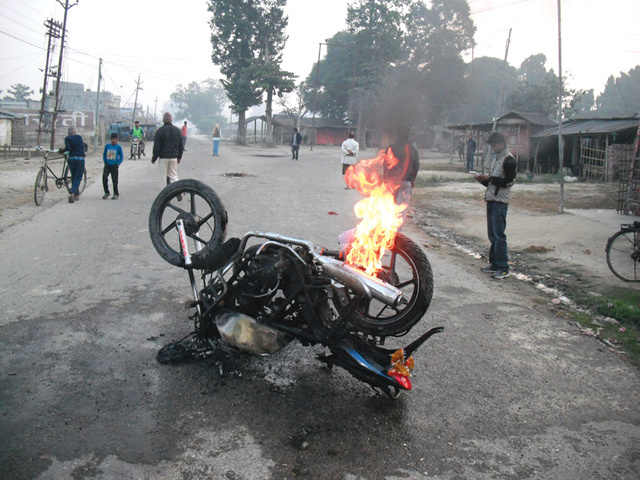 The general feeling among people in Parsa and Dhanusha is that Kathmandu would be well-advised to agree to the moderate demands of the Madhesi Front, otherwise the leaders of the plains may have the rug pulled from under them by young radicals itching to take up arms.